Freightliner Custom Chassis owners have access to the industry’s largest service network, comprised of more than 450 Freightliner-branded service locations throughout North America, including more than 90 Oasis Network dealerships. Simply enter your location below, and we’ll help you find a dealer in our service network. FCCC's affiliation with Alliance Parts ensures you have nationwide access to new and remanufactured parts while you’re on the road. 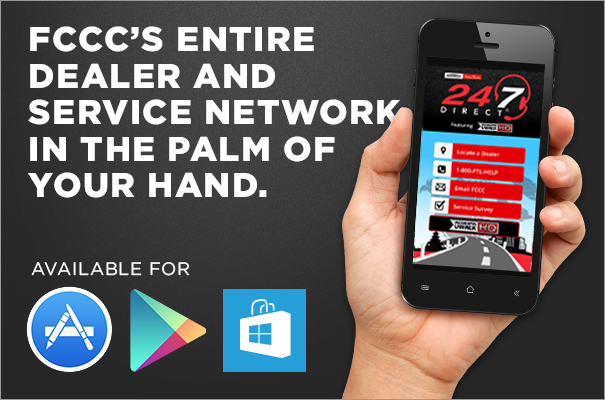 The reimagined 24/7 Direct app featuring OwnerHQ is here to help you locate service dealers, provide feedback on service experiences, store and share maintenance logs, and access service checklists, owner and maintenance manuals, dash light descriptions, FAQs and more. And of course, our factory-direct phone support is always just a click away. Download the app today! Are you a new owner of an FCCC shuttle bus chassis? Find your owner's manual here.